Who are all these guys anyway? Welcome new and returning readers! 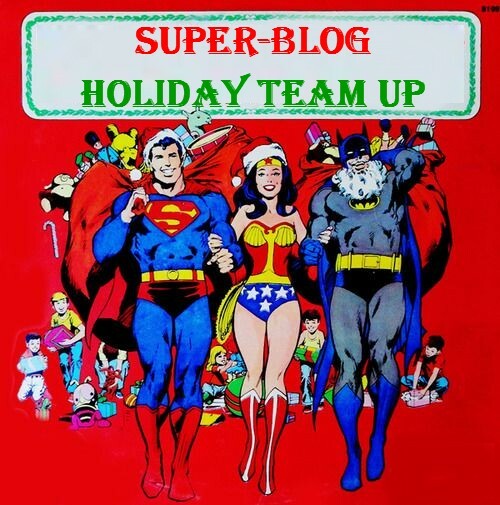 It's time once again for an additional present: a SUPER BLOG HOLIDAY TEAM UP! Enjoy today's review and then remember to check the links below to great holiday themed articles by my fellow comic bloggers. Happy Holidays! In nature it means eating your own kind and it is a recipe (heh, a recipe!) for disaster. Once you start chowing down on your friends and neighbors in the same genius and species you are decreasing the number of fertile organisms that are available to help you perpetuate the next generation of you. In marketing the same hold true, to an extent. If you are Coke and you make 100 varieties of Coke, you are cannibalizing the main brand's name for a tiny fragment of the market that you don't capture with that main brand. While at the same time increasing costs in both production and marketing. It can be done successfully in large markets with a small number of competitor. However it is costly and it is tricky. If your goal is market share and not pure profit, it is the only way to go once your main brand hits a plateau. Thus we have the Impact line from DC and Archie comics. 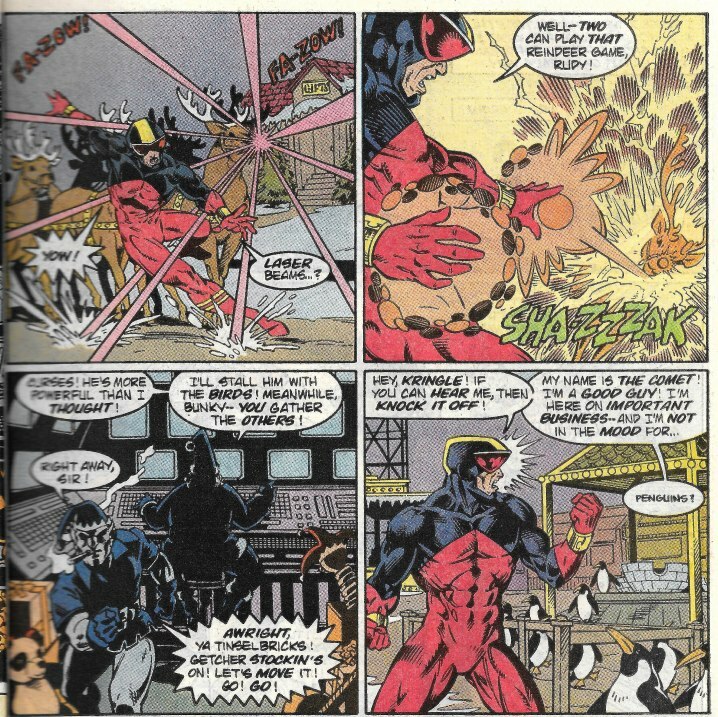 The imprint was a line of titles featuring straightforward superhero tales aimed at teenage audiences. It staggered around for a couple of years before being abandoned due to poor sales. A huge A-List of writers, artists and luminaries worked on the titles, however and some of the stories were decent adventure tales. This was my first toe dip into the Impact pool and while I didn't find it terrible, I wasn't much enthused by the stories or the characters. 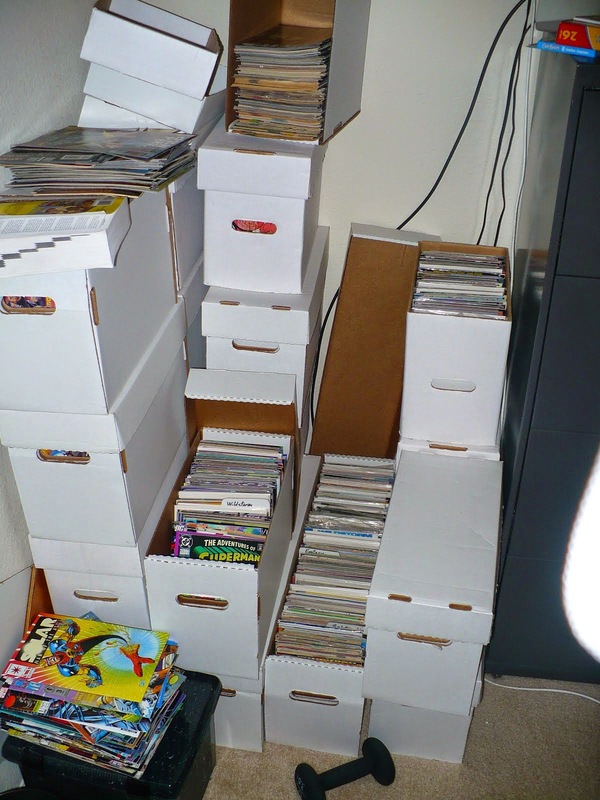 We might get to blame that on the sheer volume of stuff this Winter Special contains. 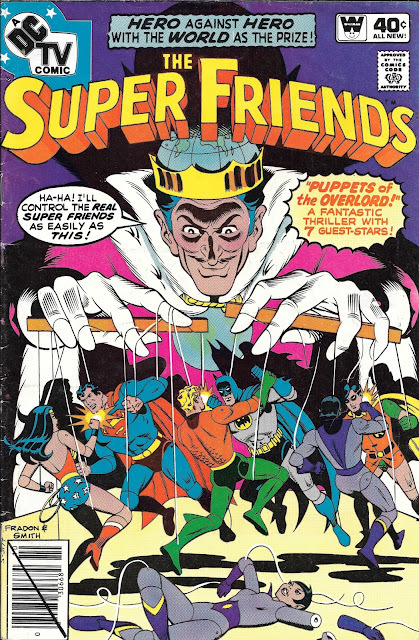 There are seven different teams working with six different heroes and a wrapper beginning and ending. Even at 64 pages there appears to be no space to really introduce any of them effectively and tie their story arcs in convincingly. The book is a muddle, with each solo hero tale feeling stale once you realize they are pretty much all the same plot just with a different character in the center seat. This is depressing, as a book such as this should have been the natural "jumping on" point for many readers. I'm going to say I didn't like it, no matter the talents involved, and they are too numerous to mention. I'm going to keep their names out of this review for the most part for sake of brevity, but believe me when I say most of these guys are slumming and this issue is far from their best work. Let's tackle our wrapper, shall we and then we can see about how much of each tale we truly want to dive in to. It's Christmastime in Washington and it appears that George H. W. Bush is seeing to the White House Christmas tree lighting ceremony. When suddenly! All of the children in the choir end up being midget robots. I hate it when that happens. 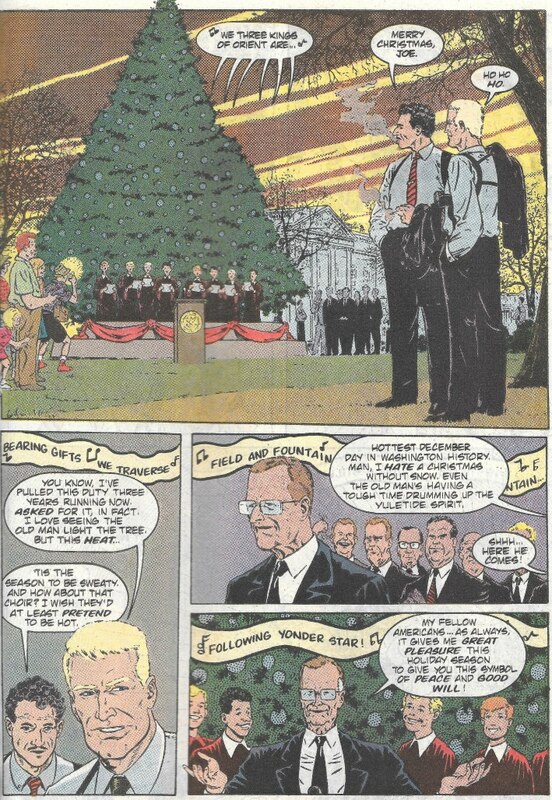 … and before you can say "Dan Quayle's potato," we have a half page of Exposition! explaining that the President was abducted by Indigo (You killed my father, prepare to die! 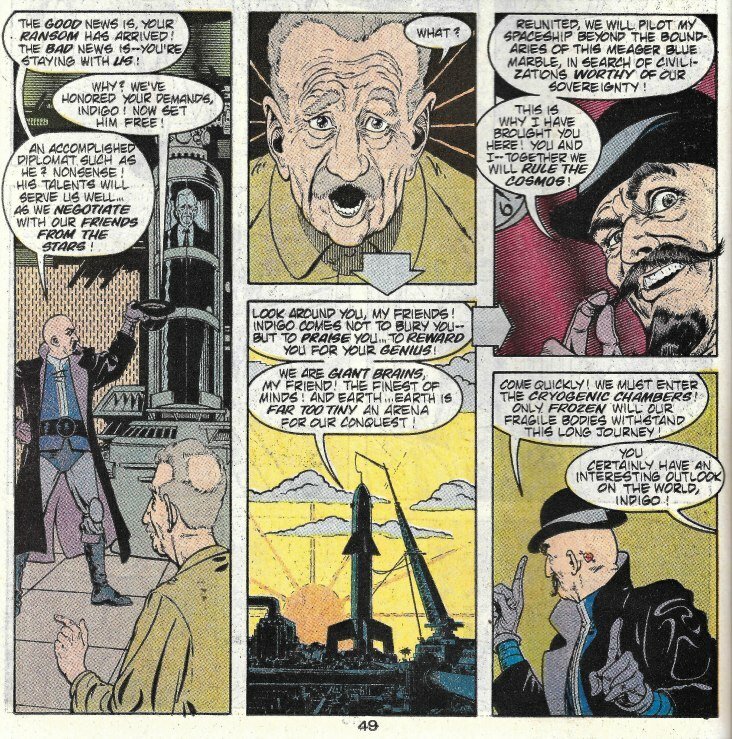 ), a crimelord who once had a lab full of super-scientists called the Magi. Now he wants those Magi scientists back, but he wants the government to do his dirty work. To affect this, he's kidnapped the President to force their compliance. This sounds like a great setup, except that the five stories that follow this are all exactly the same: Superhero finds hideout of Magi member. Superhero attacked by superscience thing. Superhero outwits thing. Magi meets superhero and agrees to come along peaceably. The ending wrapper is the only part of the story that has any variation to it. But let's take a look at each section. 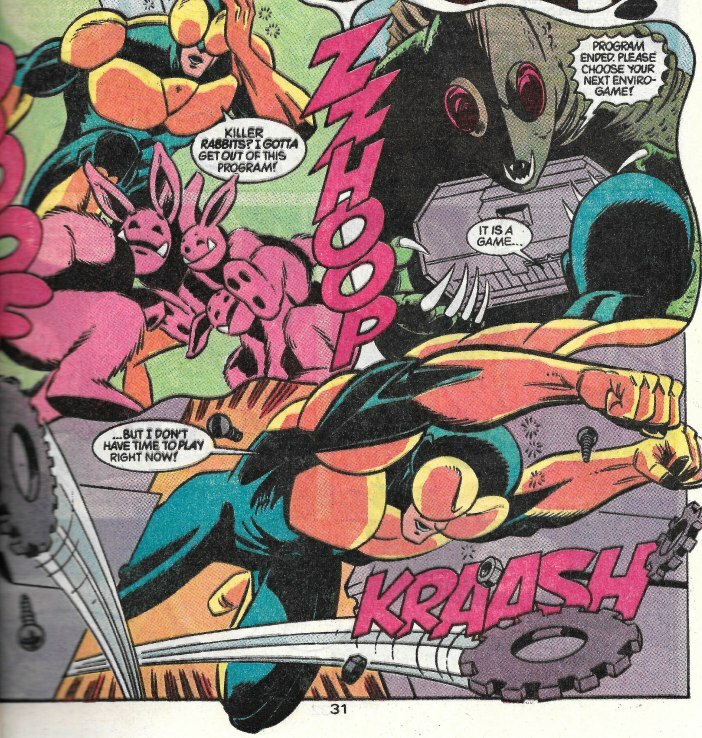 First up we have The Web attacking a tank thing that shoots missiles under orders from Jason Troy, Director of Web. There really is no space to get to know these three or their dynamic. Some punchy dialogue is all we really get. It looks like this is some real fierce battle with tons of powers in play, none of which we really get into the details of. For instance what is a Pressor Beam? 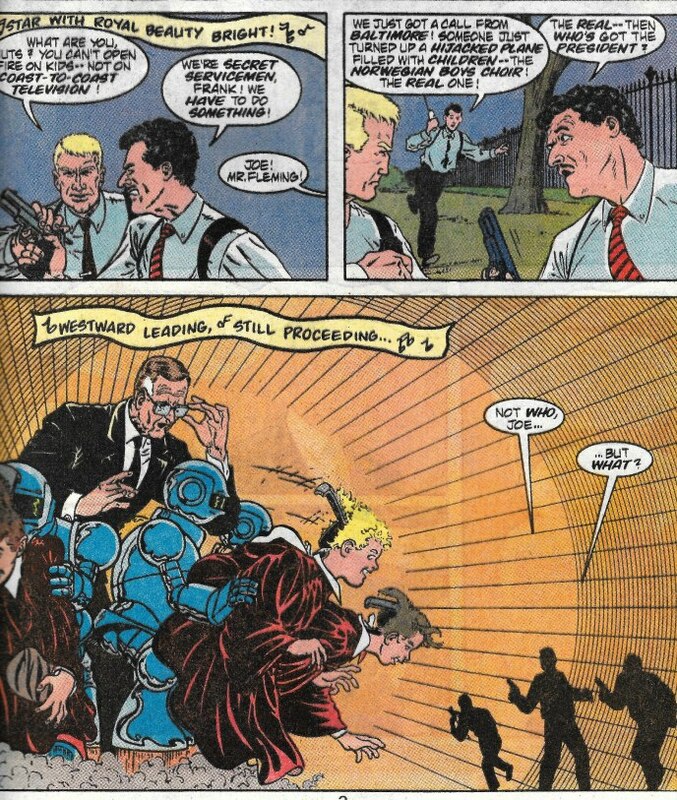 And why does one guy get guns, but no Iron Man repulsors stand-ins like the girl? It all could be explained but isn't, which defeats the purpose of introducing us to these new-to-us characters in the first place. It is then revealed once the tank is disabled that the scientist inside is the Magi member the Web is "looking" for. 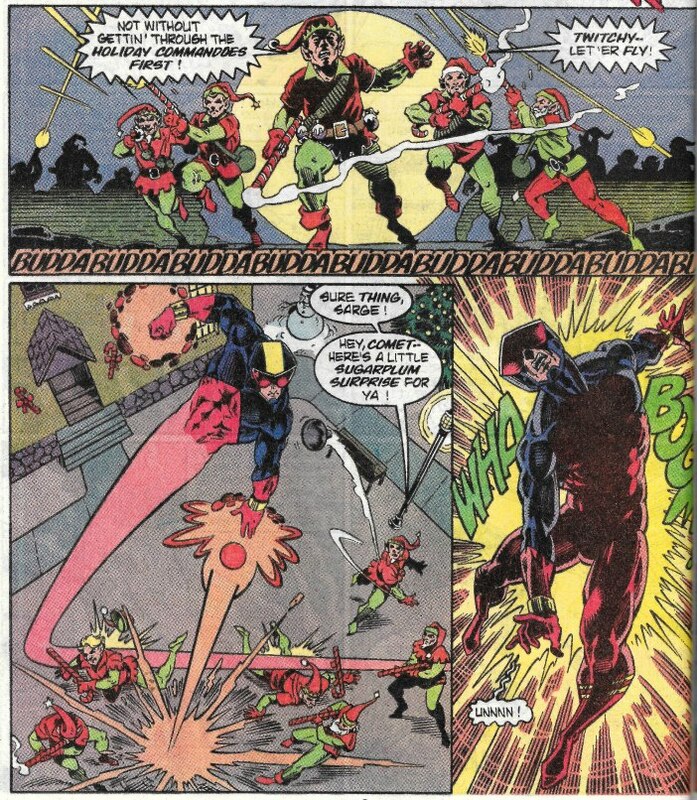 He goes to meet his destiny at the hands of Indigo(Montoya) but with one of the Web agents tagging along. Next up comes the BEST of the five middle tales: The Comet racing to notify his scientist, who just so happens to be playing Santa in a Christmas Village themepark. 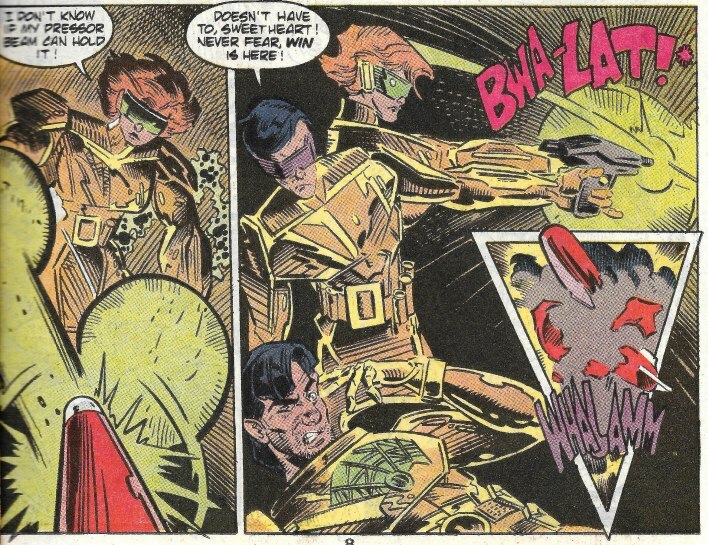 Mark Waid pens this part and Tom Lyle is on art duties. This is a great story and made me think the issue would pick up after it. Sadly it didn't, however the intro to it was clever: The Comet hitched a ride because it is too hard to see street numbers while flying. The driver of the truck he was in gave him a hard time about it and the "bucket" on his head. Upon arrival he heads into the village only to find the Santa scientist has activated booby traps through-out the park. 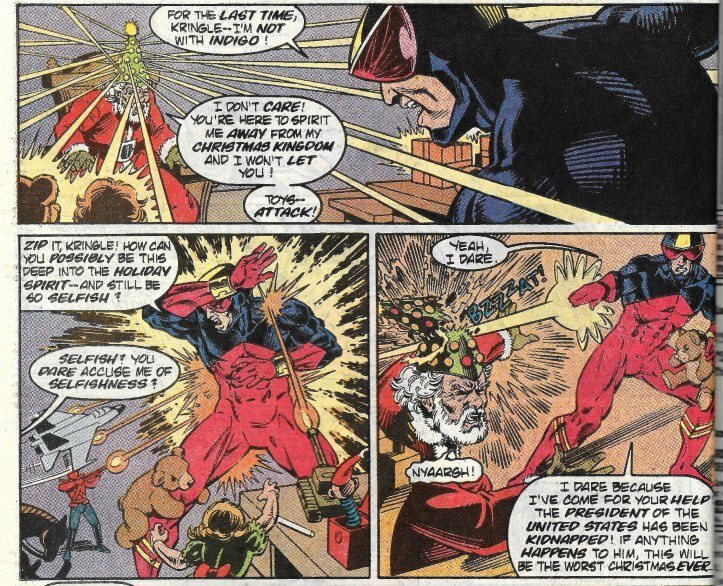 …and leading up to a confrontation with a deadly laser Christmas tree wearing mad scientist himself. 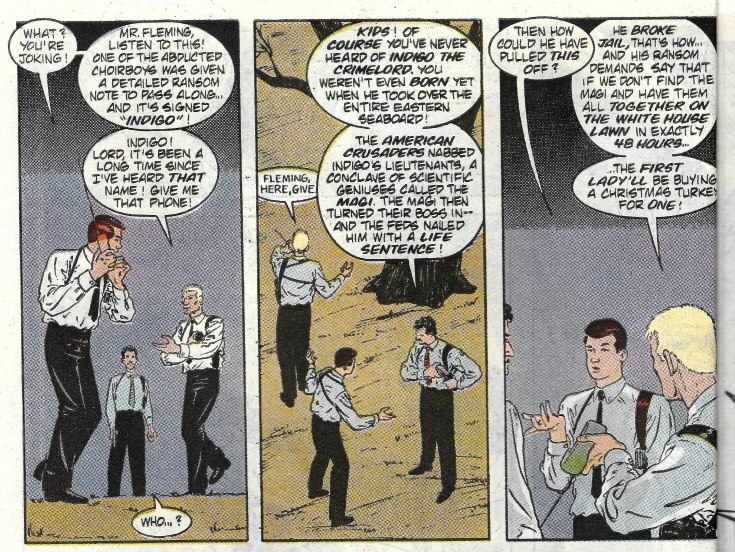 Which ends after he says the stuff in this panel and we are on to the next section. 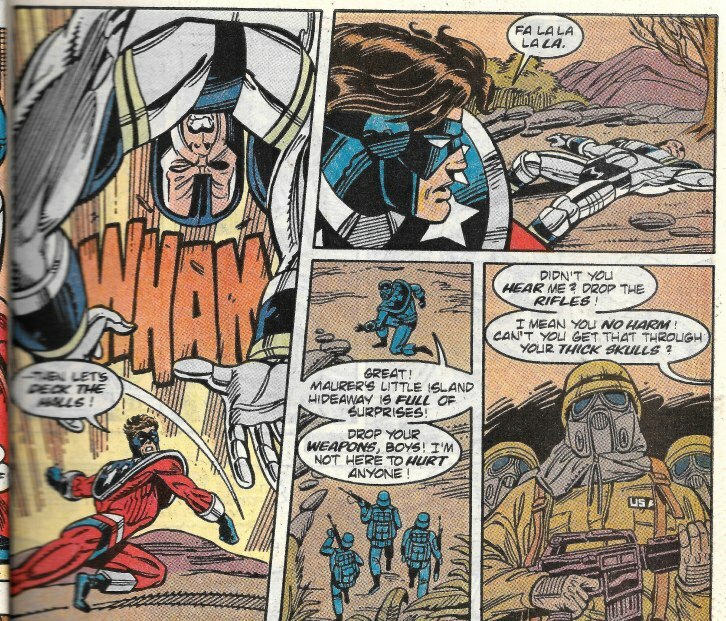 After that great piece, we move on to The Shield, who is a riff off the Captain America archetype. The story is a bit sluggish after the inventive fun of the last spot on segment. It has The Shield making his way to a seemingly empty bunker, when his path gets blocked by quicksand, old enemies and undead soldiers. Again, there is a scientist behind it and as soon as he is told about the president, he capitulates. 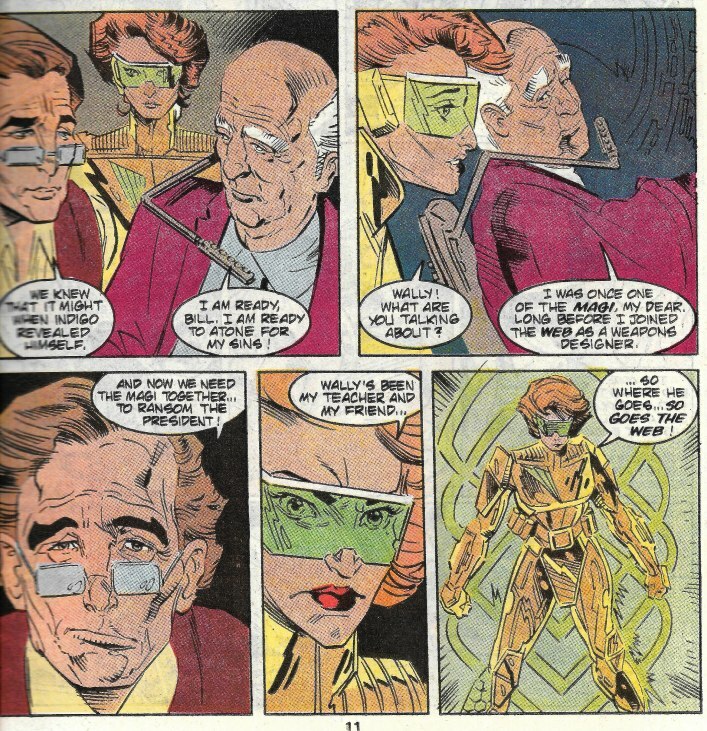 I think there is supposed to be a parallel drawn here between the scientist's struggle and The Shield's. I believe he operates outside the system. However these concepts are not fully fleshed out so the context of these remarks loses a lot of poignancy. *Yawn* how many is that? Oh! 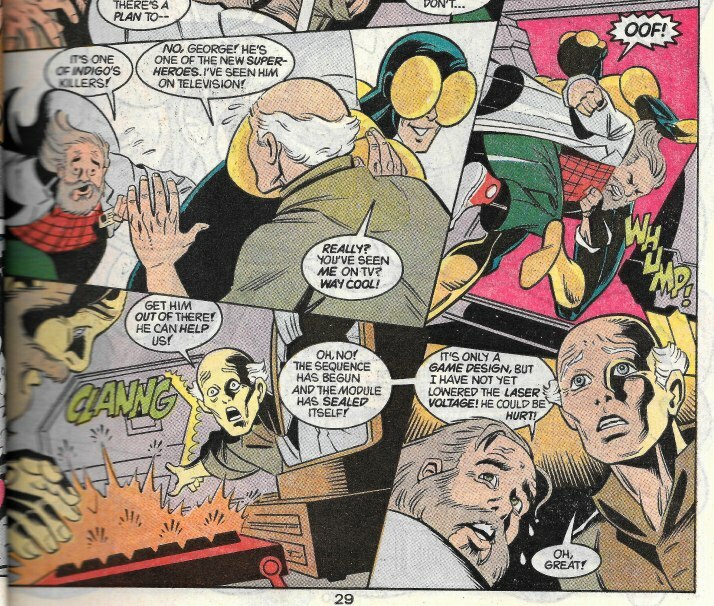 We are up to The Fly, an adolescent superhero in the Spider-Man archetype. He tags along after his Gramps, who has been tasked with finding the next scientist on the list. While endeavoring to capture him, an accident happens. …that leads to the fly being trapped in a "danger room" type device, which he defeats in the manner shown, leaving us to move on to part number five. And five is the "work alone" Batman-Punisher type The Black Hood. He seems the most antisocial of the group and doesn't get to be included in the wrapper. 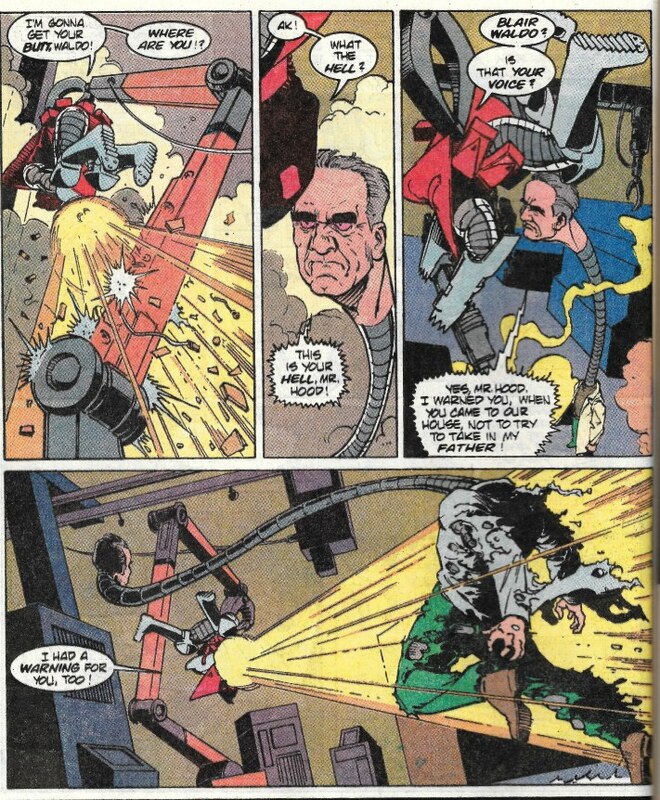 He goes in to a warehouse and beats up this robot duplicate of the guy he's looking for. It appears the daughter of the scientist was behind it all and she vows to go in his place. 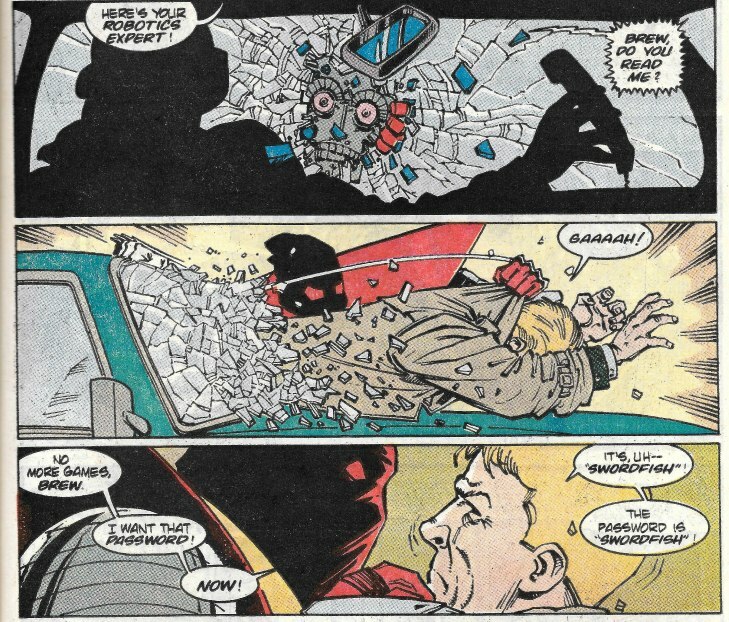 Also he acts belligerent to his agent handler, tossing the robot through the guy's car and threatening his life. At least it tries something different, even if it doesn't really succeed. 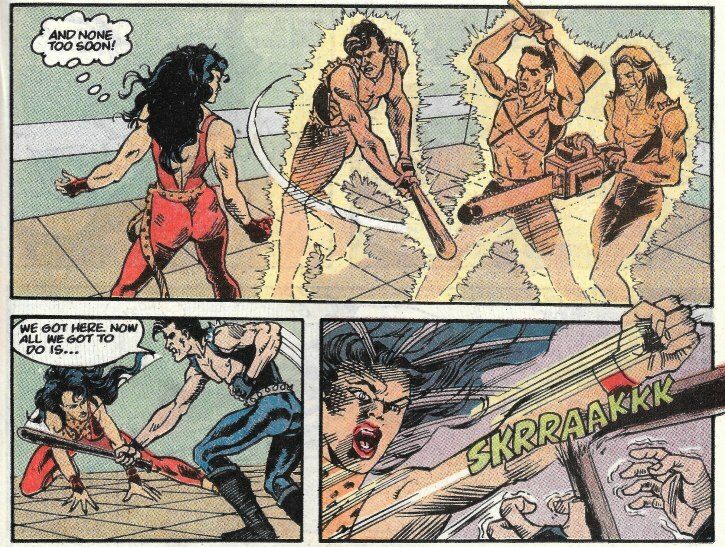 Last up we have our Vixen-archetype, The Jaguar, and if you don't see why I question the logic of these character models the answer is that some of them pull readers from existing DC characters (like vixen) who really couldn't stand to have a lower sales point. And we are back to the wrapper. The heroes secretly go in place of the scientists and surprise Indigo (YouKilledMyFatherPreparaToDie! ), who literally TWIRLS HIS MUSTACHE!!! He reveals that he wasn't planning on letting the president go as he needed him to negotiate deals with ALIENS IN SPACE! Not making that one up. And he has more tricks up his sleeve as they've all been teleported into his rocket, which he fires off into space with everyone on board. A battle ensues. 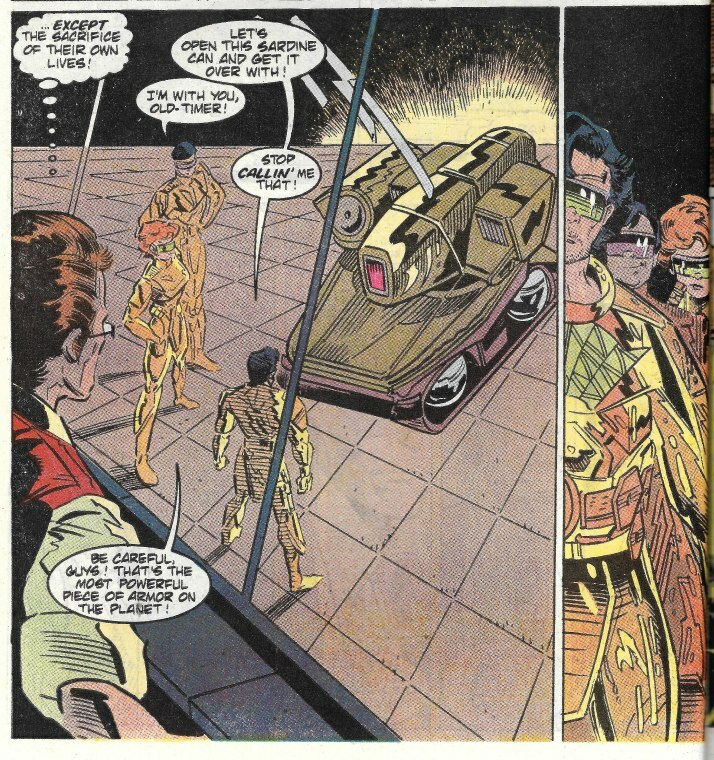 The heroes teleport the Prez and themselves out using Indigo's equipment right before the rocketship blows up. This wasn't a good place to start with these. Had I liked any one character (and I did, The Comet), the intro here is too brief. Plus the recycled plots seemed to drag the issue down. I was looking for some pow and bang when all I got was sad slide whistle. Had the Impact line succeeded, DC might have regretted their involvement. The line looked to pull mainly people from Marvel type books, however there is always a fight for the dollars of the public. These WILL come up again in the Crapbox, so if you liked the look of one or more of the stories, be sure to watch for them. But now you are in for a cache of surprise Presents as the Super-Blog Team-Up crew have a few more Christmas themed things to throw your direction. Check out the links below for some great articles all centered around the season. As always have a great time and thank you for visiting the Crapbox.